If you are thinking about selling a home in the near future, make sure you determine the real estate turnover rate for your neighborhood. The real estate turnover rate is simply the pace at which homes are selling for homes like yours, in your area, and often times this is referred to as the "liquidity" in the market. So many homeowners allow a real estate agent to give them pricing guidance without first understanding the liquidity in the market, and that is a great way to join the ranks of other people who have failed to sell a home. When we are looking for the real estate turnover rate in Tallahassee, we find a market that is purely working in the favor of buyers right now. 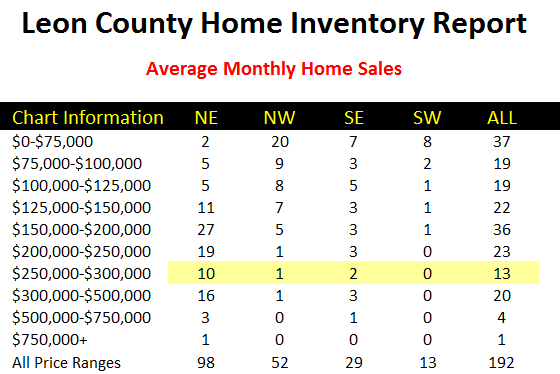 The following table shows the relative supply of homes for sale in Tallahassee, and every single area and every single price range is still above 6 months of supply. As an example (in the table above), the Northeast Tallahassee housing market has 12.4 months of supply of homes priced between $250,000 and $300,000. Simply put, if no new homes enter the market at that price point (and nobody in the price range above reduces their price into it), then we have all the homes need for more than 12 months at our current rate of demand. This is not good if you own a $250,000 home to sell in Tallahassee. The following table shows the real estate turnover rate in Tallahassee. It is the current monthly rate of demand (the number of homes that should sell each month in the Tallahassee MLS/ not seasonally adjusted). 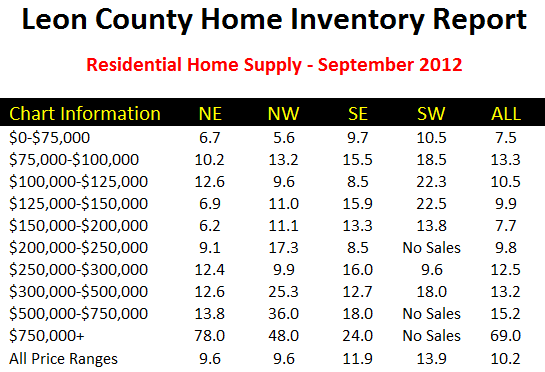 So using the $250,000 to $300,000 price range in NE Tallahassee, home sellers should expect 10 homes to sell each month. Of course, we know that fewer homes sell this time each year than do so in the Summer, so I would expect 8 to sell in the month of September. If you have a home to sell in this price range and area, don't you need to be one of the top 8 best deals in order to sell this month? Now that we know the current real estate turnover rate, we only need to look at the competition to help us determine the best price point, right? 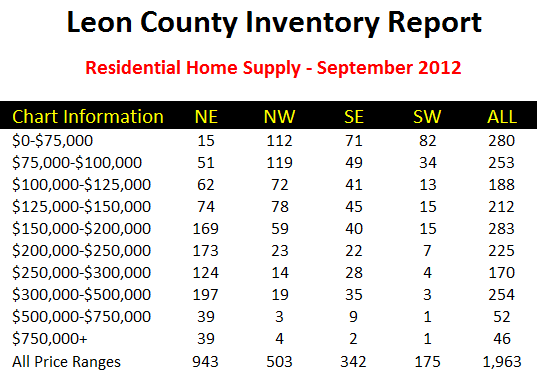 Again, using the $250,000 to $300,000 priced homes in NE Tallahassee, we can see that there are 124 on the market. If you want to give your home the best chance to be sold in the next thirty days, you have to be among the best 8 homes in this 124 home group (top 6%). That's right, only 6.5% of these homes on the market will sell in September, will one of them be yours? It can be! If you would like to know how to get your home sold fast, by having a great understanding of the real estate turnover rate, just drop me a note and we can schedule a time to evaluate your home and your specific situation. 60 out of 480 sold (or turned over), so last year's rate would be 60/480 or 12.5%. Good info, thanks. The more data the better. I am new, transitioning from school principal to Real estate over the last year, going full time in June. Used to own five multi-families as private seller and buyer. Thanks Jim, it certainly is "must have" information to help home sellers with their pricing. Ah Michel, ... you want to know how to figure out who is moving next so that you can work with them as a real estate agent. That is a completely different set of data (study marriages, funerals, social media, occupational changes (hiring/firing/promotions) etc.). How do I find out how many homes are in a certain neighborhood and how many homes have sold recently? Michelle, most competent real estate agents will have that information, you can turn to them. If you want to try to do it yourself, your best option is likely the Tax Appraiser's website or physical office.